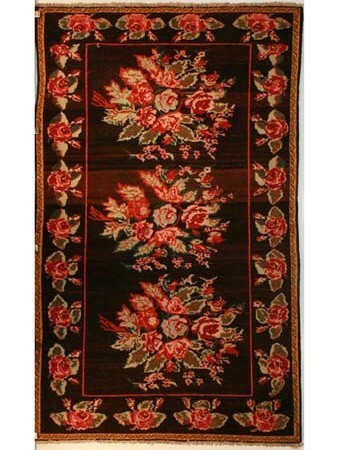 Is This a Karabagh or Bessarabian Rug? Is this really a Karabagh rug? 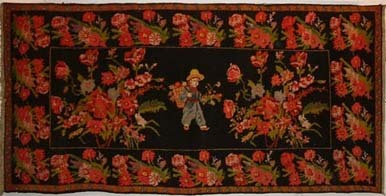 It looks Bessarabian to me with the naturalistic floral motif and the black background. And yet, at the site where I found it on the Internet it is clearly identified as Karabagh woven in 1930. And how about the one below? It too is identified by the seller as Karabagh. It seems obvious the two rugs are from the same region. But Karabagh? Quoting from one of my favorite rug books, Oriental Rugs: A Complete Guide by Charles W. Jacobson: Some of them used stylized flowers (very angular) in large clusters. OK, I can see the large clusters…and I think I recognize the angularity. 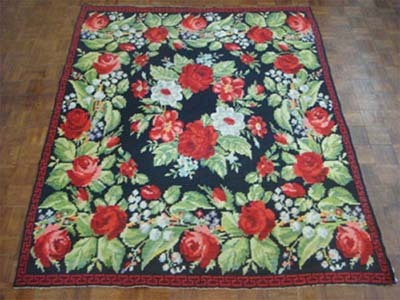 And after comparing it with a rug identified as Bessarabian and naturalistic (below) I am beginning to see the difference. I actually thought that the forms in the two rugs above could be described as naturalistic. I learned something…maybe.